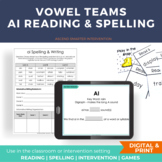 Vowel digraph- This vowel digraph pack includes a word sort, concentration game, and making words sheet to use for the spelling generalization for vowel digraphs ai and ay. Word sorting is a brain-based activity that will really get your students looking more critically at words and their patterns. 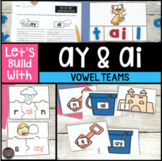 I created this worksheet to give my students a chance to practice spelling with the vowel digraphs ai and ay. This is the phonics/spelling skill for Mama's Birthday Present, Unit 4, Scott Foresman Reading Street.They love drawing the pictures to illustrate the words. This set contains doggy vowel digraph dominoes for the following digraphs: ai, ay, ee, and ea. There is also an alphabet order activity for those same digraphs as well. 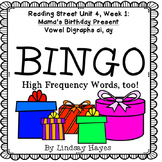 This Bingo game includes 6 different game boards that all include the spelling rule for the week in addition to the high-frequency words for the week. 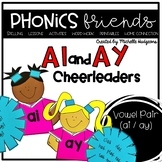 A great game to practice phonics and spelling skills in a small group setting! Printer Friendly! Also included in: Journeys Unit 3 BUNDLE! 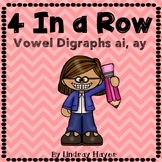 This 4 In a Row game was designed to include a sampling of words with vowel digraphs ai, ay. 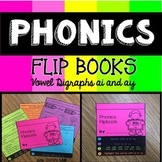 It is a fun way for children to practice and apply their knowledge of these phonics skills in an engaging way! 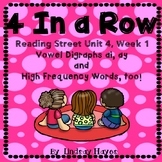 This 4 In a Row game was designed to include words that align with the Reading Street skills for the week in addition to the high frequency words. It is a fun way for children to practice and apply their knowledge in an engaging way! It is differentiated for on-level and advanced-level play. 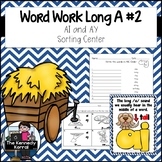 Students will practice reading and writing words with ai and ay. 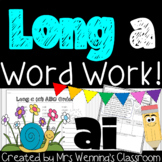 Long Vowel A (Digraph ai Pack) - A Week of Plans, Activities, and Word Work! 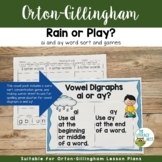 Also included in: Digraphs Bundle! 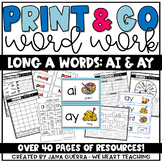 10 Weeks of Lesson Planners, Activities, and Word Work!!! 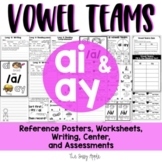 Vowel teams ai and ay: worksheets, reading passage, writing, assessments & more! 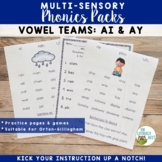 Also included in: Long Vowel Teams Bundle: Worksheets, Reading Passage, Assessments and MORE!